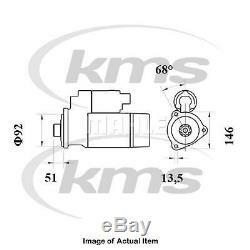 New Genuine MAHLE Starter Motor MS 761 Top German Quality. Belt Tensioner Wheels & Bkts. Mirror Heads, Housing & Motors. UK Reg No/Vin MUST be supplied. The compatibility is only a guide. Voltage [V]: 24 Rated Power [kW]: 5.5 Number of Teeth: 12 Tooth Pitch [mm]: 16 Flange Ø [mm]: 92 Connecting Angle [Degree]: 68 Number of mounting bores: 3 Mounting points diameter [mm]: 146 Bore Ø 1 [mm]: 13.5 Transmission Type: with reduction gear for flywheel depth [mm]: 51. Any of the brands above, equivalent or OE supplier brands may be supplied UNLESS customer specifies. OE Part Number (or Equivalent). AS-PL : S5243S , ATL Autotechnik : A 78 510 , ATL Autotechnik : A 90 520 , AUTOTEAM : SMI618 , AUTOTEAM : SMI631 , BORG BECK : BST32066 , BORG BECK : BST32841 , BOSCH : 0 001 261 049 , BOSCH : 0 986 025 450 , BOSCH : F 042 001 199 , BOSCH : F 042 001 203 , BTS Turbo : S512313 , BV PSH : 811.502.123.370 , BV PSH : 811.502.123.380 , BV PSH : 811.502.123.500 , BV PSH : 811.516.123.130 , BV PSH : 811.516.123.310 , BV PSH : 811.516.123.370 , BV PSH : 811.516.123.371 , BV PSH : 811.516.123.900 , BV PSH : 811.520.123.130 , BV PSH : 811.520.123.210 , BV PSH : 811.520.123.370 , BV PSH : 811.520.123.515 , BV PSH : 811.526.123.380 , BV PSH : 811.526.123.381 , CASCO : CST35618AS , CASCO : CST35618GS , CASCO : CST35631GS , CASCO : CST35669GS, CASCO : CST35669GS , CEVAM : 8122 , CEVAM : 8178 , DRI : 638047124 , DRI : 638054124 , DSS : 208572OEM , DT Spare Parts : 2.22010 , DT Spare Parts : 6.27218 , EAA : EAA-111896 , EAA : EAA-121069 , EAA : EAA-121559 , EAA : EAA-121598 , EDR : 910109 , EDR : 910539 , EDR : 910539X , EDR : EF19010 , EDR : EF19350 , ELSTOCK : 45-3445 , ELSTOCK : 45-4127 , ERA : 220558 , ERA : 220563 , EUROTEC : 11090273 , FARCOM : 106848 , FARCOM : 107864 , FEBI BILSTEIN : 48995 , FEBI BILSTEIN : 48997 , FRIESEN : 8825450 , HC-Cargo : 113830 , HC-Cargo : 114872 , HC-Cargo : 115875, HC-Cargo : 115875 , HC-Cargo : 115884 , HELLA : 8EA 012 586-051 , HELLA : 8EA 012 586-291 , HELLA : 8EA 738 258-381 , IMEX : IMX 00420572417 , IMEX : IMX 00421632127 , LAUBER : 28.1388 , LAUBER : 28.3041 , LUCAS ELECTRICAL : LRS02274 , LUCAS ELECTRICAL : LRS02455 , MESSMER : 220558 , MESSMER : 220563 , PE Automotive : 080.807-00A , PowerMax : 88212911 , PowerMax : 88213893 , PRESTOLITE ELECTRIC : M90R3547SE , PRESTOLITE ELECTRIC : M90R3557SE , PRESTOLITE ELECTRIC : M90R3558SE , REMY : 19081000 , REMY : 19081015 , REMY : 19081028 , REMY : 19081900 , REMY : 19081901 , REMY : DRS0109 , REMY : DRS0539 , REMY : DRS0539X , SANDO : 6035618.0 , SANDO : 6035618.1 , SANDO : 6035631.1. Any of the brands above / below, equivalent or OE supplier brands may be supplied UNLESS customer specifies. Our couriers will usually deliver between 7am to 7pm (Monday to Saturday). Estimates can be provided beforehand but prices may differ upon ordering. Such charges are the responsibility of the customer and NOT included in our prices. Help is available Monday to Friday from 8.30am to 5.30pm, and on Saturdays from 8.30am to 1.30pm. 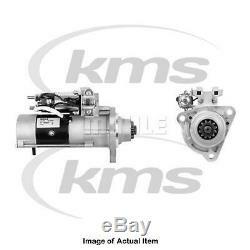 The item "New Genuine MAHLE Starter Motor MS 761 Top German Quality" is in sale since Saturday, November 10, 2018.